Best test management tools: the idea implementation starts with a clear planning of the whole process. Product owner or Project manager has to select the best team, grant the responsibilities and assign tasks, and choose test management tools to be used for the entire software development life cycle. test management system – Create and manage projects, members. test planning opportunity – creating test plans, test cases, test scenarios or user stories. test run availability– creating test runs, managing members of the testing process, usability and efficiency. making test reports on work quality and quantity. task management tool – the bug tracker availability and its speed. using additional features – import/export, integration with other systems, crash analytics etc. TestRail, made by Gurock Software GmbH Company, was the first tool our team used for planning and testing. The company founded in 2004 has created a range of test tools but the most successful product is TestRail. The system is not the best in every our criterion for best test management tools, but every above-mentioned functionality is more or less available in the service. Our team focused its attention on creating test cases when worked with TestRail. The tool has a user-friendly interface, intuitively comprehensible buttons’ arrangement, and carefully thought the system of switching between contiguous features. You can try TestRail for free just following the official website it for free via this link. It is one Open Source project in the list of known test management tools and that’s why it takes the second place on our list. It has a simple interface and “technical” design with no frills. In spite of some difficulties with installing, it is used by many Development Teams and QA Engineers. Testing Life Cycle begins with creating a project, adding members and assign them roles. It is quite the same as in other development tools. TestLink does not have its own bug tracker but it successfully integrates with other similar systems for issues tracking. Here you may download the tool with the installations and settings manual provided. These two tools could be analyzed separately. 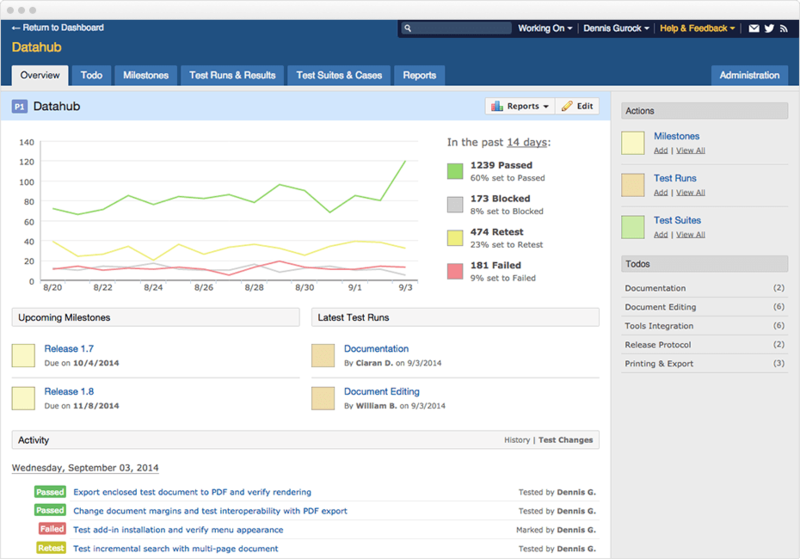 JIRA has a few choices for test cases writing services, however, it is the best and perfectly integrated bug tracker for Zephyr. Many IT developers know that JIRA is mainly a bug tracker aiming to control development process with tasks, bugs and other types of agile cards. Zephyr is one of the many JIRA’s plugins extending JIRA’s capacities. JIRA+Zephyr‘s advantage is a low basic price and the range of different price tiers. You can find Zephyr in JIRA’s search system for plugins or by clicking on the link. PractiTest integrates with some of the same systems such as JIRA, Pivotal tracker, Redmine and other. If you have some atomized tests working with Selenium or Jenkins, this test management tool is able to work with them too by using API. You can try this system for free. Another tool we have tried is qTest by QASymphony Company. The project has been being developed since 2012 and aims at helping not only the testers but the entire team during the development. Many qTest users consider its interface to be simple, and user-friendly. As other systems, this product integrates with similar services and you may use a trial. Here you can get information on quality in the form of Success Rate depicting how good your product is. Furthermore, there is Spent Time functionality which helps rating how much efforts each team member has contributed. You can try TestCollab by the link. This service allows customizing not only the standard fields concerning test cases and test runs, it gives an opportunity to create roles, categories, priorities, choose necessary parameters to be depicted in the graphics, export settings. In addition, you will always be in the loop on the Project overview & activity page. You have to pay the fee not for the number of members but for the number of test cases written and passed. Except for above-mentioned features, QACoverage has a few more. It has its own bug tracker Defect Module. Using the service, there is no need to integrate with other systems to create issues. In addition, the developers have paid a great attention on customizing of all forms and parameters, making an entire menu tab called Form Builder. If you don’t use certain fields for creating a test case or a defect, the admin can make separate forms for each project. All users can try QA Coverage for free of charge for 3 months. A great attention is paid on test cases export from .csv files. TestCaseLab offers its own format of such a file for import which is a nice test case example for beginners. The service integrates with the following bug trackers: Redmine, JIRA and Pivotal. TestCaseLab provides 30 days of free trial. Taking into consideration that the most of systems have a more narrow functionality, our search has stopped. We need a system “all in one” not to waste time on looking for plugins or studying API to customize other services. write test cases – you can structure them with a few useful parameters. execute testing – an extremely flexible test run process with an opportunity to immediately create issues. a customized bug tracker – a simple agile board containing a few columns, statuses and parameters. Furthermore, EasyQA has a great advantage – EasyQA SDK. If your test product is a mobile app for Android or iOS, it proves useful. Our library is able to catch and send crashes to dashboard. It allows taking screenshots, recording video, making bugs and sending all of this to our bug tracker from the phone. EasyQA SDK makes for our product several additional “+” in our comparative table of known test management tools. One more EasyQA advantage is Test Object Sharing – now you can share the link to your test object from our service, no need to use other services or plugins. EasyQA now has a beta-version and it is free of charge. Register and try EasyQA product. Summing our research up about modern test management tools, we should mention that all of the systems are worth your attention and are widely used for quality improvement of the product under development. The market offers many other systems each of which has its own view on development and testing process. Choose the one you like the most and make your interesting and well-worked ideas come true. you are truly a just right webmaster. The web site loading pace is incredible. It sort of feels that you’re doing any distinctive trick. Furthermore, The contents are masterwork. you have done a wonderful job in this matter! You could definitely see your enthusiasm in the article you write. . At all times go after your heart. Generally I don’t learn article on blogs, nonetheless I would like to say that this write-up quite compelled me to test out and do it! Your composing taste was amazed me. Thanks, very fine article. Thank you, Alma Neil. We are really appreciated that you liked our article. I’m evaluating another tool, Plutora Test. Has anyone used it before. Would be keen to hear feedback. Hi, Vijay. Unfortunately, we haven’t used Plutora yet. We will try to do it on occasion. Of course, we’ll share our experience in our blog. Yes, you are right, we’ll observe this tool and will add it to our list. HPE ALM rules all. Integrates with IDE, cross project asset sharing, automated/scheduled test execution. Thank you, we will look at this tool.